Another aerial photograph taken from a small private plane, this time just northwest of Warren, Ohio, The large plant in the center is Copperweld Steel, originally founded in 1915; the Warren plant was its second, opened in 1939. Although Copperweld Steel initially specialized in copper-clad steel, the Warren plant focused on the manufacture of steel billets. It was taken over in 1975 by a French corporation, marking the first hostile takeover by a foreign corporation of an American company. When the U.S. steel industry went into crisis in the late 1970's and early 1980's the Warren facility was spun off into a separate company, CSC Industries. After CSC's 1993 bankruptcy its assets were purchased by Hamlin Holdings and are no longer operated under the Copperweld name. Copperweld was served in Warren by the Baltimore & Ohio's Lake Subdivision, which can be seen running from the bottom center to the upper left. This view is looking north, with Warren just off the bottom of the slide. 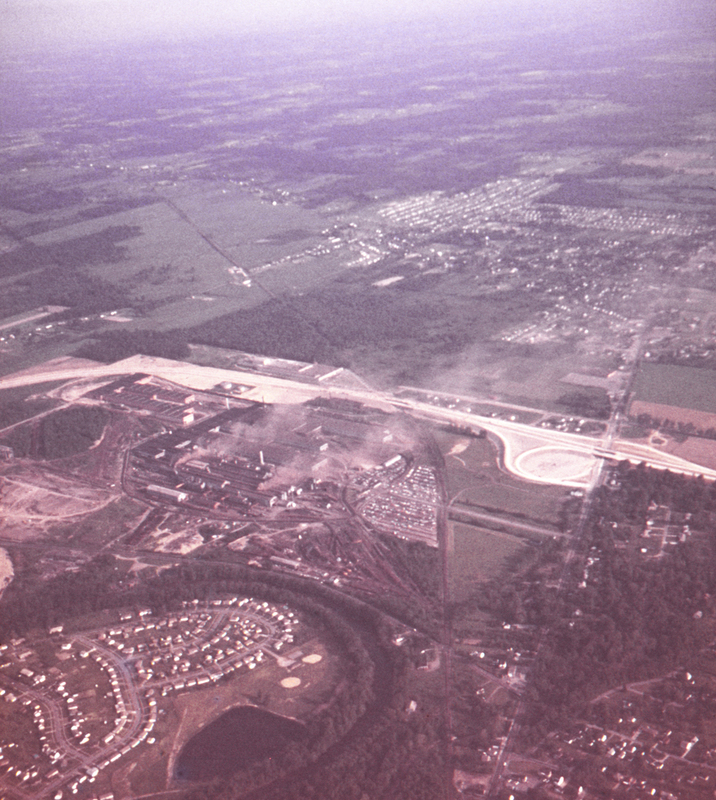 The relatively new Ohio Route 5 bypass stretches across the center of the picture, with Champion, Ohio visible in the distance. Today a part of the Lake Subdivision, under the name of the Warren & Trumbull Railroad (an Ohio Central subsidiary) continues to serve the plant under its new ownership, with the original line abandoned from there to Painesville.